The Euro advanced for the 4th day in a row, amid broad US dollar weakness and the renewed demand for the Sterling after PM May's hard-Brexit deal failure at the Parliament yesterday. Moreover, we had a busy economic schedule, as the EU released Industrial Production for January, which rose by 1.4% MoM, while 1.1% decline YoY, both beating market's expectations. In the US, inflation at factory levels increased by less-than-anticipated in February, while January Goods Orders were better-than-expected up by 0.4% vs. a 0.5% decline expected. Today, Germany will release February inflation, while the US will release the Initial Jobless claim figures, but traders will mainly focus on January New Home Sales. 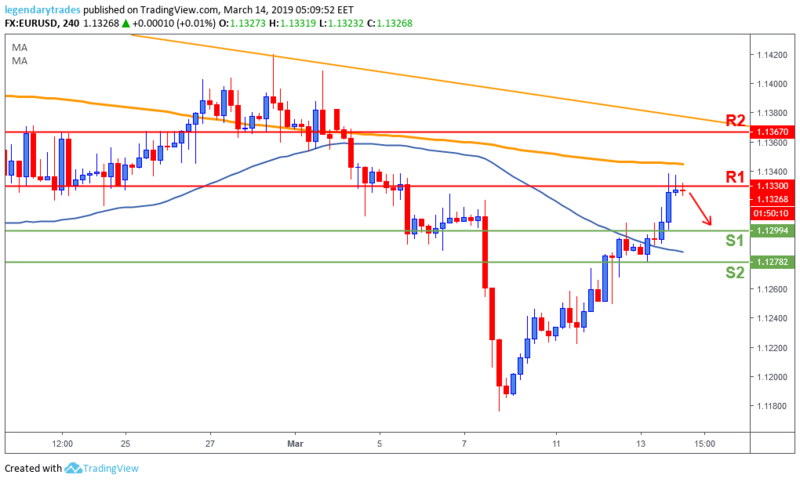 The Euro broke above the 50-day moving average and the 1.13 previous resistance level and headed towards 1.1330 (R1) where price currently found some resistance. If the bears will successfully hold this level, we could see price pulling back towards 1.13 (S1) to retest it as a new support. Alternatively, if price breaks above 1.1330 (R1), the bulls will regain momentum and possibly start targeting 1.1367 (R2).